learn what are scalene triangles. see some examples on identifying them. The study tips below will give you a short summary on this. The math video below will explain in depth about this. Furthermore, it will show some examples so that you can understand this lesson better. Scalene Triangles from MathExpression.com on Vimeo. In this lesson, we will learn about scalene triangle (ST). A triangle is a ST, when all the sides of the triangle, have different lengths..
Now, to demonstrate this, let's move vertex 'C' to the left. Here, we can see that, all the 3 sides of this triangle have different lengths. Hence, this is a ST. 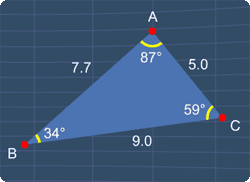 It is important to note that, the interior angles will also be different. Let's continue to move point â€˜Câ€™. Now, when these two sides have the same length, it is not a ST.
As we continue to move 'C', we will get a right triangle. 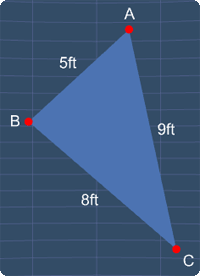 A right triangle, can also be a ST, when the length of each side is different. However, it will not be a scalene, if two of its sides, have the same length. Since this triangle has 3 sides of different lengths, this is a ST.
Next example. How about this triangle? We can see that, these angles are not the same. This means that, these 3 sides must have different lengths. Hence, this is a ST.
Last example. Now, these 2 sides have the same length. Therefore, this is not a ST.
You can start by going through the series of questions on scalene triangles or pick your choice of question below.